No second guessing, no questions of identity - just stick-and-stay simplicity. That's what you get with the Self Adhesive Name Badges. Improved flexibility makes the badges move with clothing and stick securely to fabric without curling at the corners or falling off. 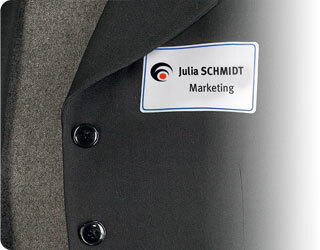 Plus, the Peel-Away Design allows for quick and easy name badge separation - a major time-saver when sorting and distributing badges at large events. Guaranteed Jam Free printing on laser printers.